So Close To Saying Goodbye! I cannot begin to thank everyone for their kindness, help and generous support shown to me during my time here at Legal Services Corporation. Some of you may not know but I am Jacquelyn Richards, and I have had the privilege, this summer, to intern in the Executive Office. I have so many stories that I could share with you all, about the wide range of experiences that have spanned my twenty-three years. But there is only one story that is worth sharing today, and I believe it speaks to the impact of Legal Services and the role that people like you play, to promote equal access to justice in our nation and to provide high quality civil legal assistance to low-income persons. I have seen firsthand how poverty affects families. I come from a single-parent household with four siblings, two who have special needs. Despite this, I committed myself to excel in school and to be the first in my family to graduate and go to college. In order to achieve this goal, it did not come without its challenges. Living in an impoverished urban area I got my first taste to the justice system when I was attacked by a gang in high school. Like many families across the United States, my family and I found it difficult to access justice. Not only criminally, but civilly when suing the school for negligence and against their zero tolerance policy, which resulted in my expulsion from the school. Throughout all this darkness, I arrived at a new private school the following year and there was light! I met a representative there from The College of Saint Rose, where I recently graduated (the first of my family!) with my Bachelors in History & Political Science. Saint Rose led me here, to Jim, and LSC. Against all odds, I rose happily and inspired; I then began my quest to secure justice for marginalized communities. LSC– little did you all know, you not only provide civil legal services to low-income Americans, you actually took one in as one of your own and provided her with more resources that she can and will continue to share with an abundance of personal connections, families, and communities. 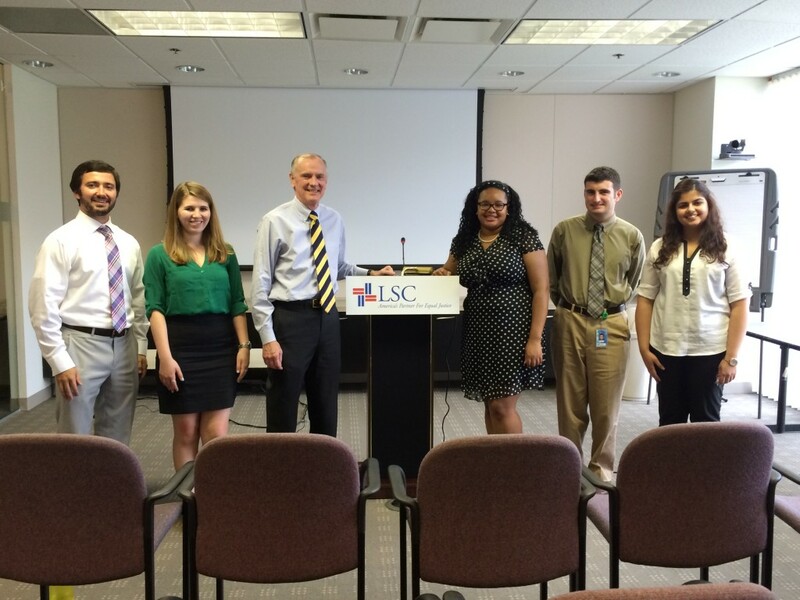 Interning for LSC was a chance to step outside the world in which I grew up, where I was comfortable and successful. LSC has also given me the confidence in myself, I lacked for so long. I will use this new-found courage to (1) tell you all how grateful I am for this opportunity and (2) to continue OUR fight for equal justice. I am returning to Albany, NY with two job offers; one with the NYS Senate, the other an intellectual property law firm. I will also be working on completing my law school applications. I intend to pursue a dual-degree program to obtain my JD and Masters in Public Administration with additional schooling in Mandarin Chinese. My long term goals are to become a city planner and work with cities much like my home city, and do the very thing that all of you are doing— support communities by providing equal access to justice in our nation and to provide high quality civil legal assistance to low-income persons. Your generosity and commitment is exactly the kind of work people like me need to expand the opportunities available, and to enhance the lives of the next generation. Tags:Albany NY alumni blog civil legal aid internship law firm legal services corporation LSC NYS Senate project 70 summer internship the college of saint rose The College of Saint Rose Albany Washington D.C.